Hot and spicy, chipotle hot sauce from smoked red jalapenos, onion, tomato and spices. (pronounced "chee-POHT-lay"). 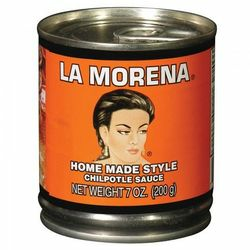 Salsa Chipotle de La Morena con un picante medio a base de jalapeños rojos ahumados molidos, cebolla, jitomate y especias. GREAT beans, tons to freeze or feed a crowd. Get a combo of 4-5 canned beans, drain. Fried a ton of oinions, a head of garlic, some bacon or sweet sausage (meat optional), a bunch of chopped parsley, a couple of cans of fire roasted tomatoes. Flavor with a little splash of vinegar (any kind), a dollop of mustard, a few drop of Worcestershire sauce only if you have some already. Add the drained beans to the fried onions & garlic, add everthing else and as much of the can of Chipotle sauce as you. like I use 3/4 to a whole can. Everyone will love it, if they like hot, spicy food. P.S. I use a combo of red and white beans because it's pretty that way. Red kidney, those pink ones, cannalini, butter beans. Drained. ProsMakes easily dressed up beans (onions, etc) really special. For a group or for cooking ahead and freezing all but enough for you to overeat the first night. ConsI don't know anything else to make in quantity with this sauce, but as my husband and friends love these beans, that doesn't matter. This is my goto secret ingredient in many dishes but mostly salsa. People cannot get enough.